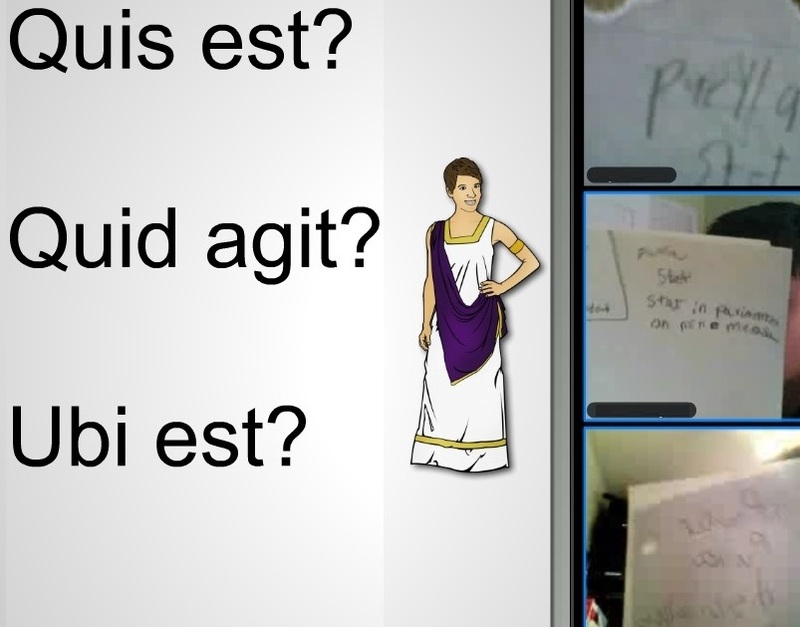 Latin…Online…3rd Graders (oh my!) | Magister P.
This is my first post about Teaching with CI Online, but I’m skipping ahead to showing some student work samples before explaining a bit about how CI Online is working out. That post will follow shortly. That is all to say that not even one student had a full 8 hours of listening to and reading Latin. In a brick and mortar class setting, there is never a “full” number of language hours as there are class days, but in this case it was a LOT lower than the number of days given all of the challenges. I’d say that the work shown here represents ~5 true hours of Latin although all data goes by class days. The process for the Dictātiō is exactly the same as brick and mortar, except I just ask them to hold up their paper to their camera every now and then before typing the sentence on the whiteboard for them to see. I did not explicitly teach macrons, but instead provided a Pop-Up reason for why they’re there during the first Dictātiō when a student asked about them (i.e. “they represent a long sound”). As you can see, they are hearing, and noting those differences just fine. These are 9 year olds. OK, so the kid at the bottom is on an iPad and the work is mirrored, but it’s pretty clear they are getting this stuff. I love how the one in the middle says “standing on the floor, OR not on the table.” I didn’t ask them to tell me what they weren’t doing…this kid just decided to use some Latin because it’s cool, and he can. Win. A puella had a telophium. Puella in America. Ursa in china habet piliam. The pulla volt piliam. The ursa non. Spelling mistakes, but no big deal. 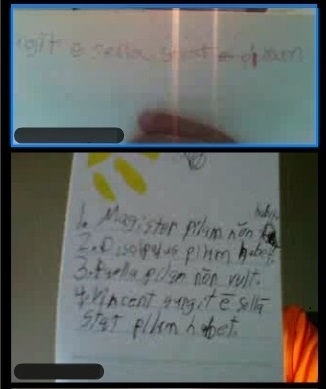 Remember, this is actually the first thing the kid wrote in Latin on his own, even if it was a retell. Note the English word order despite my strict phrasing of verbs in final position – a change from last year for me. Also note how the student is trying to express “a” and “the” even though there’s no equivalent. This all makes sense when a Novice language learner uses native language (L1) to fill in target language (L2) gaps. All of the information in the retell is accurate based on the story told in class, which was a really short story asked over 20min. the class prior to this. I must admit that I violated the magical TPRS order because we never got to reading the story before they retold it, but that makes this work all the more impressive for retelling after 2 days and no reading activity. Lastly, note that habet means “has,” and the student instead wrote “had” in English knowing that there’s probably a different word for the past tense. THIS IS WHY WE DON’T SHELTER GRAMMAR. The kid is 9 years old and wanted to express something in the past tense…there’s no reason we shouldn’t do this, even after just ~5 hours of Latin! Some teachers on the moreTPRS Yahoo group are freaking out about teaching the past tense to high school students. Don’t. They can handle it. The girl has a telephone in the U.S. but she wants a ball. The ball is in japan and a bear has it, so the girl travels to Japan to get the ball back. In conclusion, she gets eaten by the bear. So the girl gets the ball in the end. OK, it’s in English. So what? This proves comprehension, which I’m fine with given this context. This is from a students who missed 3 out of the 8 hours that were free from technical issues. Under those circumstances, an English retell is perfectly acceptable. This retell proves comprehension, but not quite 100%. This student mixed up China (in the real story) with Japan (the other option we didn’t choose as a class), but also wrote a new ending (guess which part), and added a logical detail, although I had to get into a 9 year old’s mindset to work that one out (i.e. she gets the ball in the end because the bear ate the ball…the whole reason the bear has it in the first place). Had we spent more time on the story, I might even have asked “why did a bear have the ball?” Clearly, this student would’ve been ready with a compelling answer. My presentation of new vocabulary required more steps than anticipated (not just a few words on the whiteboard like in brick and mortar) such as preparing questions ahead of time in a PowerPoint, and showing responses after question slides…is this because of young age, or because of lack of physical proximity in a virtual classroom? Pingback: CI Online: Welcome to a virtual classroom! | Magister P.